This bed features a sleek design, which adds a simple yet sensational allure to any bedroom. Create that comfortable and contemporary bedroom you always dreamed of. 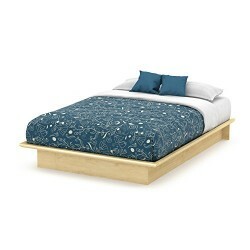 This platform bed will go with any other pieces from South Shore’s collections in the same finish. This collection was designed just for tighter spaces! The furniture lets you picture a simple décor that’s brought to life through the use of bright colors. Let your imagination go wild, and see where it takes you! Economic choice: does not require a box spring. The space under the bed can be used for seasonal storage (sheets, clothing, etc.). Rounded corners for increased safety. Profiled edges that help the mattress to stay in place. Can support a total weight of up 500 lb. Mattress and accessories not included. The assembly for this bed has been reworked and improved, as of January 2015. Requires complete assembly by 2 adults (tools not included). 63.87” (W) x 82.37” (D) x 9.62” (H). Box dimensions: 84.75” (L) x 21.5” (W) x 5” (H), 130 lb. Ships in a heavy box, make sure to have a friend with you. Packaging tested and certified to reduce the risk of damage during shipment. Made in North America with non-toxic laminated particleboard. 5-year quality guarantee. Any questions? Contact South Shore, the manufacturer, available 7/7 by phone, email or chat. Bed board broken, within 6 months.Need spare parts.